Young scientists from Galway Educate Together National School and St James National School, Bushypark, Galway supporting the Fantastic DNA National school roadshow with Cell EXPLORERS team member Ivor Geoghegan. Four NUI Galway public engagement and education initiatives have been awarded funding of more than €250,000 through the Science Foundation Ireland Discover Programme. The initiatives, which will improve public understanding of science, technology, engineering, and maths (STEM ) in the West of Ireland and across the country, will engage over 40,000 members of the public in 2017. 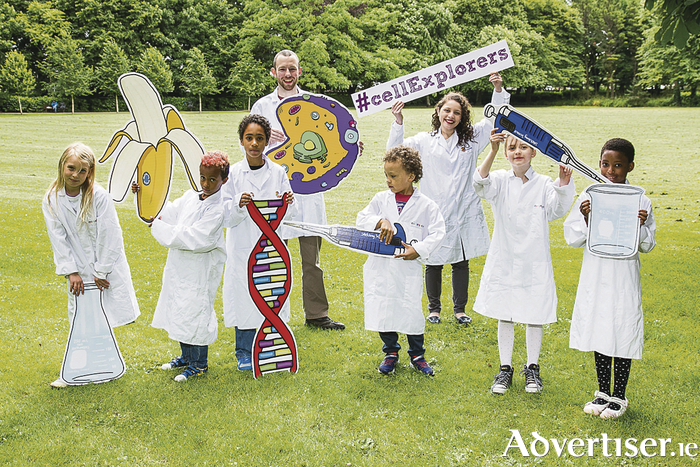 ‘ Cell EXPLORERS’ is a science education and public engagement programme delivering STEM activities regionally and nationally, led by Dr Muriel Grenon. It uses a unique model, originally developed in NUI Galway, for sustainable science public engagement in ten Universities and Institutes of Technology around Ireland. ‘ Genetic Testing: Engaging the West of Ireland’ aims to engage students and members of the public in the West of Ireland in reflection and conversation about genetics and genetic testing. It combines an exhibition on genetics, ethics and society with activities on genetic testing with secondary school students, women and other interested groups. The project will run throughout 2017, led by Dr Heike Felzmann in the Centre of Bioethical Research and Analysis at NUI Galway. ‘ Bright Club’ is a variety show with a twist. Academic researchers become comedians for one night, using humour to talk about their research. The researchers from science, engineering, social science, and the humanities get training in humour as communication, before joining actual comedians on stage in front of the public. The night has been running across Ireland for two years, spearheaded by Dr Jessamyn Fairfield in the School of Physics at NUI Galway. Nationally, a total of 120 applications were received by Science Foundation Ireland for Discover Programme funding, and 44 initiatives were selected through rigorous international peer-review for a combined investment of €2.8 million.